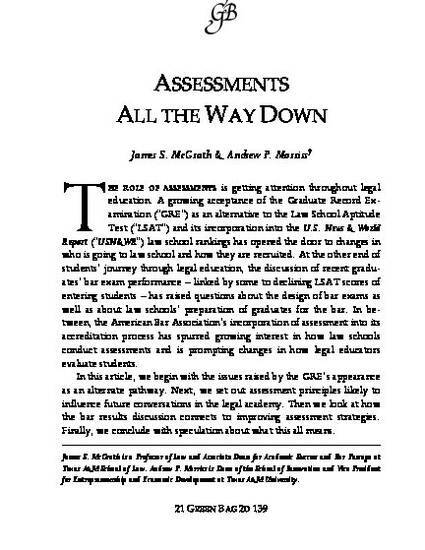 The role of assessments is getting attention throughout legal education. A growing acceptance of the Graduate Record Examination (“GRE”) as an alternative to the Law School Aptitude Test (“LSAT”) and its incorporation into the U.S. News & World Report (“USN&WR”) law school rankings opened the door to changes in who is going to law school and how they are recruited. At the other end of students’ journey through legal education, the discussion of recent graduates’ bar exam performance – linked by some to declining LSAT scores of entering students – raised questions about the design of bar exams as well as about law schools’ preparation of graduates for the bar. In between, the American Bar Association’s incorporation of assessment into its accreditation process spurred growing interest in how law schools conduct assessments and is prompting changes in how legal educators evaluate students. In this article, we begin with the issues raised by the GRE’s appearance as an alternate pathway. Next, we set out assessment principles likely to influence future conversations in the legal academy. Then we look at how the bar results discussion connects to improving assessment strategies. Finally, we conclude with speculation about what this all means.